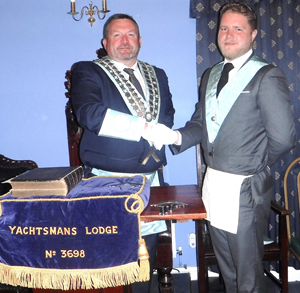 The brethren and guests of Yachtsman’s Lodge No 3698, which also incorporates Otterspool Lodge No 6605, met at Woolton Golf Club, to pass Jonathan Pagan. In attendance were group mentor Ian McGovern and former group mentor David Boyes. The WM Andrew Elton Jones welcomed everyone and proceeded to open the lodge in due form and then had great pleasure in investing Stephen Ashcroft as his senior warden, as Stephen had been unable to attend the installation ceremony. The minutes of the last meeting were confirmed and signed. The WM asked if any brother was desirous of being passed to the second degree and Jonathan Pagan stood to indicate that he wished to be passed. Paul Walls, who had only recently been made a master Mason, acted as junior deacon for the ceremony and performed extremely well. He was accompanied by senior deacon David Thomas. Both deacons accompanied Jonathan, as he was questioned and the other entered apprentice present was requested to retire, while Jonathan was entrusted. Jonathan retired from the lodge and in his absence the lodge was opened to the second degree. The WM asked James Campbell to occupy the chair for the next part of the ceremony and he was pleased to do so. Jonathan was readmitted and in an excellent ceremony he was passed to the second degree. The explanation of the second degree working tools was presented in an exemplary manner by James Campbell, after which the candidate retired. James Campbell requested the WM to reoccupy his chair. On returning to the lodge, Jonathan was given an exemplary explanation of the second degree tracing board by James Campbell. The lodge was closed to the first degree and the entered apprentice Freemason was readmitted. 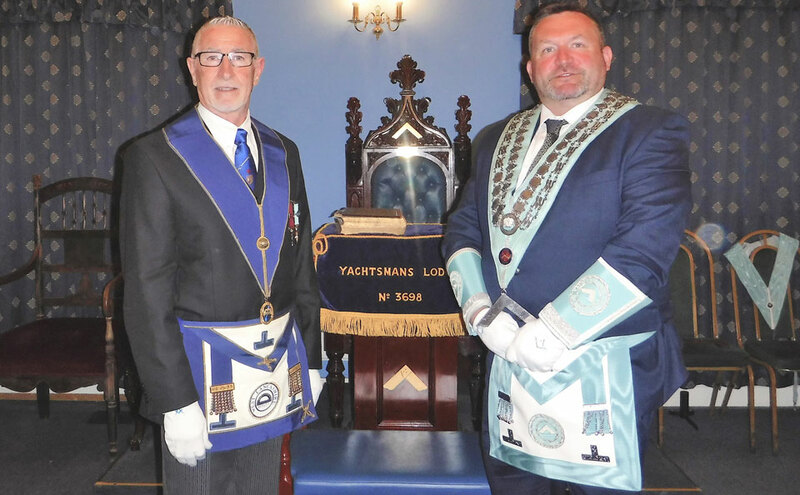 The WM requested that Paul Walls, who had recently been made a master Mason, be brought to the pedestal, where David Boyes provided him with an explanation of his grand lodge certificate. Paul appended his signature and was congratulated by the WM, who also thanked David for an providing an excellent address. After other lodge business had been taken care of, the lodge was closed and the brethren retired to the dining room, where they would continue their celebrations. Andrew Elton Jones (right) thanking James Campbell.